Spending time outdoors this past weekend was pure delight. Only a dog barking somewhere Saturday disturbed warming temperatures and gorgeous sunsets. Barking is what dogs do— at cars, at people, or for reasons known only to them. Something in the tone of this bark was troubling. Anyone who understands the unconditional love of man’s best friend could hear a plea in this bark. 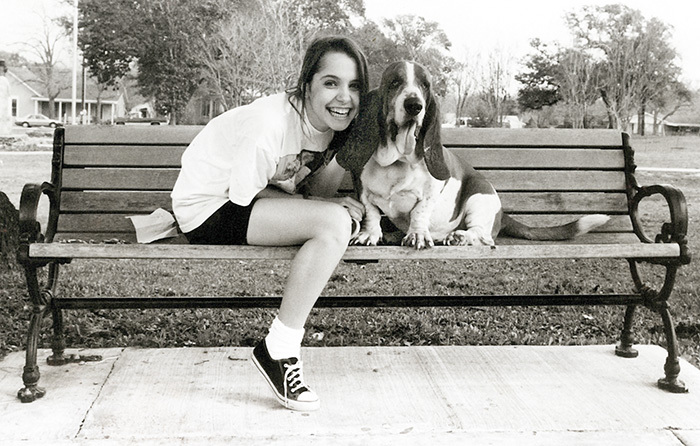 Dogs were not a part of my youth. In fact, forty was behind me when daughter Robin first wanted a puppy. Hoping her requests would be short lived, creativity flourished as I offered reasons why having a dog wasn’t a good idea. But, I ran out of excuses when we adopted a terrier mix puppy she called, “Bug,” a happy white creature with a brown face that someone had literally thrown away. Together, they taught me lessons learned from loving a dog, and that anyone who says, “It’s just a dog,” is missing one of life’s greatest joys. “He’s got you,” I retorted. “A dog friend, dad,” she replied curtly. “Let me hear you bark,” I teased her. My mind was made up, however. One dog was sufficient. I stood my ground. Headed back to South Texas the next day, Max appeared to enjoy the trip. The kids laughed and loved on the ol’ hound as we made our way out of the East Texas Pine Thicket. As I stepped into the darkness on the porch, I heard the rhythmic “thump, thump, thump” of a large dog’s tail on the wooden surface. After stroking his head, scratching his long floppy ears and assuring him he had been adopted into a good family, I bode him a good night again and headed back for my bed. Then, as the moon loomed larger over the mesquites down the hill toward the Medina River, we began to communicate. Him by resting his head on my leg and me by letting him know I was beginning to understand what Bob had said. Once again, I pounded my pillow into just the right shape and made sure my feet were covered. “Got enough room there Max,” I asked. The prince of an old dog that was to teach me many lessons about the love of a dog and I settled in together on the back porch watching a Bandera County moon and counting Hill Country stars as we both drifted off to sleep. Years flashed by as Max and I traveled Texas, raised two kids, and shared a few burgers. I never really developed an appreciation for cigars though. Kids grown and gone and me living in Center again, I was awakened again one night by another, “Oof!” I knew the tone of this one too well. Max was long in the tooth and enduring arthritis. “How will I know when it’s time,” I had already asked Center vet, Dr. Robert Hughes. I went to the living room that night and stretched out by the fireplace next to the old dog that had schooled me in devotion, love, friendship and loyalty. I stroked his head and rubbed his long floppy ears one more time. He sighed and drifted off to sleep long before I did. I’m pretty sure we both knew. Fluffing and folding my pillow, I looked out the window at the East Texas moon rising over the pine trees, knowing the phone call I had to make in the morning, and knowing that the old dog and I were spending our last night together just as we had spent our first—sleeping on the floor. Looking at nature’s spring flowering around me this past weekend, I thought about Ol’ Maxey. And I really hoped the dog speaking his heart somewhere in our neighborhood was barking at a cat, or a car. Or, for some reason known only to the dog. You know I’m a cat guy but, I love all animals and there is not too many things worse than the loss of a companion regardless of the number of legs. I’ve told this to several folks when they lost their animal buddies so, I’ll do it again for you. When I was about 5-6 my favorite cat got run over. To say the least, I was distraught. Granny told me that when you get to Heaven all the animals you ever loved would come running out to greet you. My Granny never lied so I still seek comfort from those words. When my number comes up I’m expecting a stampede.